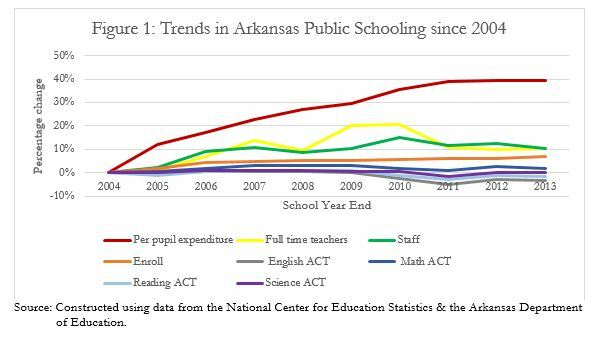 The public school system in Arkansas is funded with taxpayers’ money. Over the years, the amount of money that the state allocates per student has been rising, with the hope that the additional resources provided by more funding will improve students’ performance. What have taxpayers bought with these additional funds? Figure 1 shows the trends in real per pupil expenditure and performance indicators. It also includes the trends in enrollment and in the school personnel. The figure further shows how much each of the variables has changed compared to the year 2004. Figure 1 shows that performance indicators (average ACT scores) have remained relatively flat as real per pupil expenditure has increased steadily. There are increases in full time teachers and staff but the results of those increases are not clear. While the debate on funding has focused on whether or not open enrollment charter schools are receiving more funding than traditional public schools, it should be focused on how taxpayers’ money can be used efficiently. Open enrollment charter schools are public schools just like traditional public schools. Supporters of open enrollment charter schools believe that the students at these schools should receive public funds equal to the amount that public schools would receive in foundation aid and categorical aid. (Foundation aid is state funding given to school districts to help them meet the Arkansas Constitution’s adequacy requirement in per pupil spending; categorical aid is state funding given to school districts to help with specified needs, such school lunches for poor districts.) As part of the contribution to funding K – 12 education, the state requires that each school district set a minimum millage rate at 25 mills. A millage rate is the amount a property owner pays per $1,000 of taxable value of property. Thus a millage rate of 25 mills is equivalent to $25 in taxes per $1,000 of property value. School districts can set the millage rate above the state-required 25 mills uniform rate. However, open enrollment charter schools have no access to the local revenue the school districts raise on top of the 25 mills rate. For example, if a school district’s millage is 30 mills and the assessment value of a property in the school district is $1000, the extra $5 raised above the $25 collected on the property goes to the traditional public school district only. The myth that open enrollment charter schools receive more public funding has things completely backwards. It’s actually traditional public schools that receive more funding. To illustrate this difference in funding we shall consider a hypothetical school district with 500 students and an open enrollment charter school district, located in the traditional school district that are similar in every respect. According to the Arkansas Department of Education School Finance Manual 2015 – 2016, per pupil funding by type based upon 500 students is as shown in Table 1. Assume further that the property value assessment for the school district in 2014 – 2015 was $130, 420,000 and that the millage rate for the school district was 25 mills. For simplicity, we also assume that there were 100 students in each of the categories ELL, ALE and NSLA. For the ELL the school district would have received $31,700 ($317*100) which when averaged across the whole student population is equivalent to $63 per student. 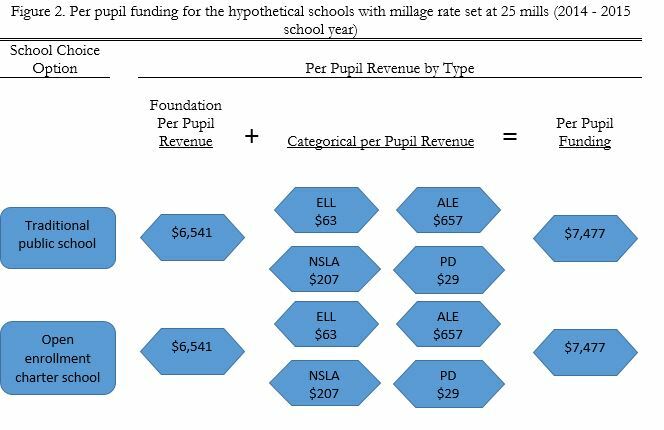 If the full-time equivalent (FTE), calculated by dividing the number of days each student was enrolled in ALE by the total number of days in the school year (typically 178) and adding those together, is assumed to have been 75, then the ALE funding would have been $328,725 ($4,383*75) which when averaged across the whole student population is equivalent to $657 per student. 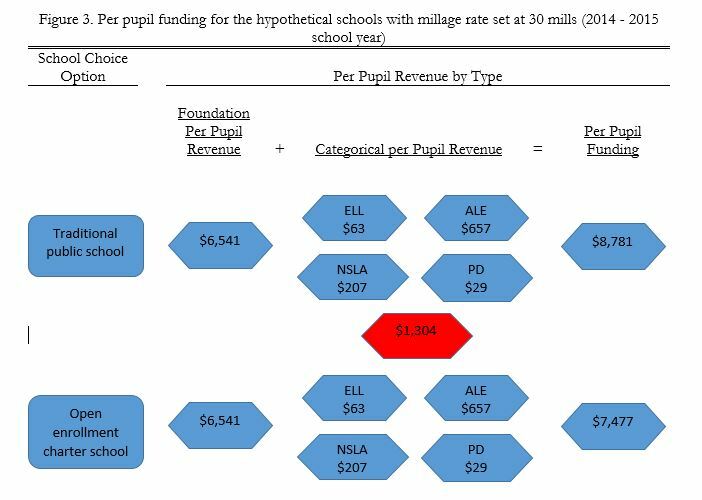 For the NSLA the school district would have received $103,300 ($1,033*100) which when averaged across the whole student population is equivalent to $207 per student. To calculate PD funding, the previous year 3 Quarter Average Daily Membership (ADM) is multiplied by the PD. Suppose the ADM for both schools was 450, then the school district would have received $14,580 which when averaged across the whole student population is equivalent to $29 per student. School districts can also receive additional funding for enrollment growth or enrollment decline. In our hypothetical example, we shall assume that there was no change in enrollment. A visual representation of the amount of funding that traditional public schools and open enrollment charter schools would have received in 2014 – 2015 school year if the millage rate is 25 mills is shown in Figure 2. The amount of per pupil funding that our hypothetical schools would have received in 2014 – 2015 school year was $7,477. If however, the school district set the millage rate at 30 mills, per pupil funding for the traditional public school and open enrollment charter school would have been different. This is be illustrated in Figure 3. With the extra 5 mills on top of the uniform 25 mills millage rate, the school district would have been able to raise an extra $652,100 (.005*$130,420,000). All the extra $652,100 would have gone to the traditional public school district. This is equivalent to an extra $1,304 per student in traditional public school. Per pupil funding for traditional public schools in 2014 – 2015 school year would have been $8,781 compared to $7,477 in open enrollment charter schools. When a student attends an open enrollment charter school, the maximum amount that a school district loses is the state foundation aid, which in 2014-15 school year was set at $6,521 per student, plus the categorical funding amount if the transferring student falls into ELL, ALE, NSLA, plus some portion of the PD. In other words, the school does not lose more money than the minimum cost to teach the student as determined by the legislature. In fact, it loses less: the school district retains 100 percent of the revenue collected from the additional mills, leading to an increase in per pupil spending for students enrolled at traditional public schools. In addition the school district receives additional money for the decline in enrollment. 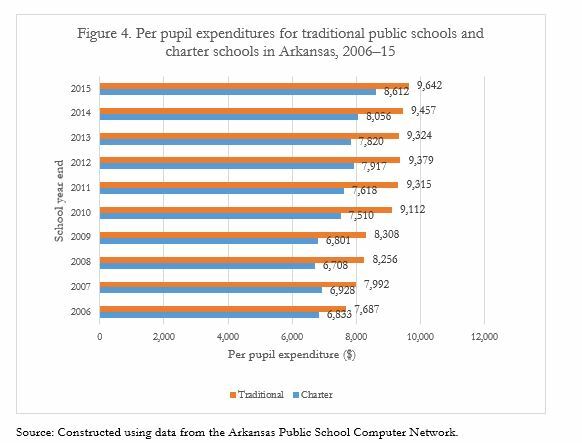 Figure 4 shows the actual per pupil spending for traditional public schools and open enrollment charter schools in Arkansas from 2006 through 2015. Notice that this amount is greater than the funding matrix amount because school districts set their millage rate above the minimum 25 mills. 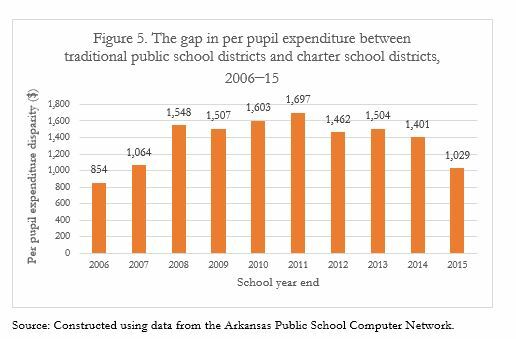 The graph shows that traditional public schools have been consistently spending more money per pupil than open enrollment charter schools. For the 2014–15 school year, for example, per pupil spending in traditional public schools was $9,642 compared to $8,612 for open enrollment charter schools. Figure 5 depicts how much more traditional public schools have actually spent per pupil than open enrollment charter schools have over the same period. On average, open enrollment charter schools have spent $7,480 per student compared with traditional public schools’ $8,850 per student. Open enrollment charter schools have been outspent by about $1,370 per student; they have been spending about 15 percent less per student than traditional public schools have been. While the gap has been declining since 2013, open enrollment charter schools are still at a disadvantage as far as per pupil expenditure is concerned. The data refute the claim that open enrollment charter schools receive more public money than traditional public schools.